Harry August has lived a very interesting life, not because of any specifically exciting or revolutionary event - he's just the illegitimate son of a servant girl after all. No, he's not anyone of significant background, but what is truly interesting about him is that no matter what he decides to do with his life he inevitably dies... only to be born again. Nothing of note really ever changes. That is, not until Harry is at the end of his eleventh life and is on his deathbed - again. A young girl visits him with an important message, "The world is ending, as it always must. But the end of the world is getting faster." This novel is the extraordinary journey of an ordinary character living a truly unforgettable existence that spans hundreds of years. It is about what Harry does with this message, what he did before he received it, and how he struggles to save the future from coming too quickly. 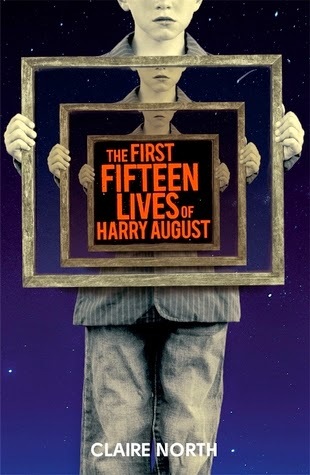 The First Fifteen Lives of Harry August has everything I want from a good story. Philosophy is a big thing that I enjoy about reading, the 'why' behind what people do and believe. I love it when an author can make me look at the world differently - causing me to become introspective, as well as understand why someone who thinks very differently than I do would choose the path he/she takes, this book did that for me time and time again. What would you do if you had an infinite amount of lives at your disposal? Would you feel responsible for changing the world for the better or leave it as it is? As soon as I think Claire North, which is the pen name of Catherine Webb, has answered all of the questions I have, she introduces a new angle to consider and a new event that makes me question everything all over again. Somehow she does this, while also furthering the plot along a decent pace and making all of the pieces fit together beautifully. As is eloquently stated on the back jacket of my copy of the book, "Some stories cannot be told in just one lifetime." There is also a vast depiction of the human struggle, poignant examples of love, loneliness, friendship, betrayal, redemption, and a creative look at the giant gray mass of what is right & wrong about the world. I can't pin down an exact genre for this work because there is science mixed with fiction and fantasy, but wrapped into our own world in such a way that makes sense and feels completely possible. It also has a lot of history and diversity of culture added that make it all the more captivating. Some books I have read do a similar thing, but most of them end up feeling like they just can't decide what they want to be and it turns into a mashed up mess of too much going on in too many different directions, but I am very pleased with how all of the different genres used in this book work together. I'm not necessarily surprised by the plot line, but I am surprised by the characters, who are all very active, and how North goes about creating this alternate kind of existence. The end of the book is satisfying and ties up what needs to be tied, but I did want more simply because I loved reading it so much and was sad to have it end. Now I simply want to read anything else by this author that I can get my hands on. This book is great for anyone who loves thought experiments as much as I do, but it is also a good book for those of you who simply enjoy adding some fantasy, science-fiction, history, and sprinkles of everything else into your adult reading list. Instead of specifying a drink with this book, I recommend going to your favorite cafe, restaurant, etc. and picking out a drink they have that comes with free refills. I also recommend getting a drink you normally wouldn't get, if you're normally a Sprite fan maybe mix it up with trying the lemonade instead. No matter what Harry August did with his life he still died and still was born at the same time in the same place. This eternal recurrence can only be demonstrated in the world of beverages with free refills for eternity, which I'm pretty sure doesn't exist, but you could come close by spending a couple of hours reading with a few free refills coming. I recommend trying something different because this book is a different experience as well, not normal for most people's literary diet, especially when discussing adult literary fiction.